We moved forward with preparing and filing an I-360 Self-Petition under the Violence Against Women Act and I-485 Application to Adjust Status to Lawful Permanent Resident on Selam’s behalf, based on the years of abuse she had suffered at the hands of her lawful permanent resident husband. Taking her immigration status in her own hands, Selam gained the courage to flee her abuser and to start a new life in safety. With each passing day as her petition and application remained pending, Selam got stronger and regained the parts of herself that she thought were lost. A respected and valued employee of the George Washington University, Selam now coordinates a program that works to develop global leaders who understand the drivers of inequity in populations and who build more equitable health systems and organizations in the United States and globally. She is truly making a difference, and now, she will be able to continue making a difference as a lawful permanent resident of the United States. 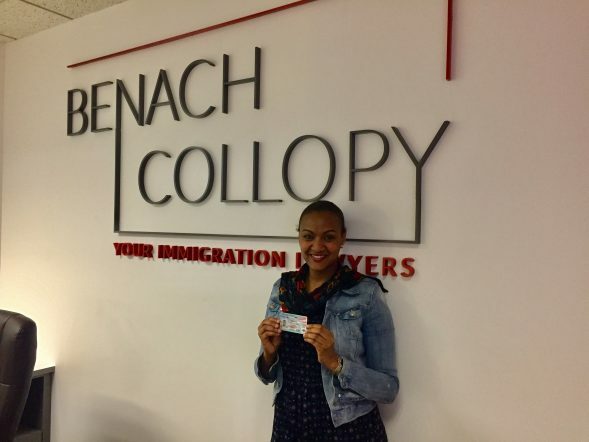 Congratulations on receiving your green card Selam! You are truly an inspiration, and we were lucky to be a part of your journey.